Don Tudor | Galion Inquirer A young donkey prepares to be petted at the Wynford FFA’s baby animals display at the Crawford County Fair on Saturday. The 160th edition of the fair is over. It wrapped up Saturday. See more photos from the fair in our online galleries at galioninquirer.com. A young donkey prepares to be petted at the Wynford FFA’s baby animals display at the Crawford County Fair on Saturday. The 160th edition of the fair is over. It wrapped up Saturday. See more photos from the fair in our online galleries at galioninquirer.com. 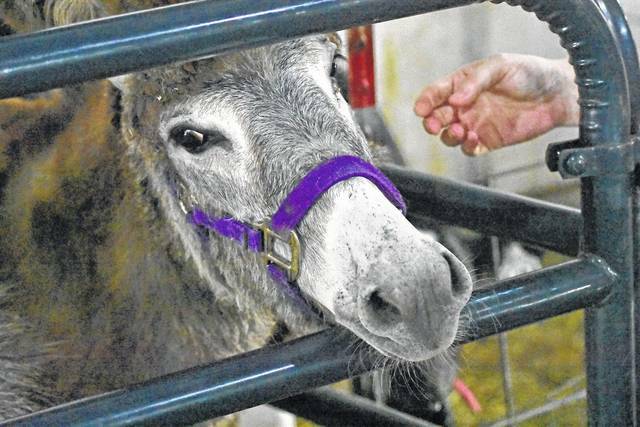 https://www.galioninquirer.com/wp-content/uploads/sites/38/2017/07/web1_inquirer-072217j-county-fair_0005.jpgDon Tudor | Galion Inquirer A young donkey prepares to be petted at the Wynford FFA’s baby animals display at the Crawford County Fair on Saturday. The 160th edition of the fair is over. It wrapped up Saturday. See more photos from the fair in our online galleries at galioninquirer.com.